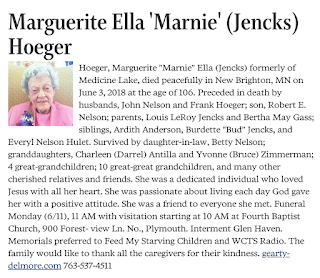 Hoeger, Marguerite "Marnie" Ella (Jencks) formerly of Medicine Lake, died peacefully in New Brighton, MN on June 3, 2018 at the age of 106. Preceded in death by husbands, John Nelson and Frank Hoeger; son, Robert E. Nelson; parents, Louis LeRoy Jencks and Bertha May Gass; siblings, Ardith Anderson, Burdette "Bud" Jencks, and Everyl Nelson Hulet. 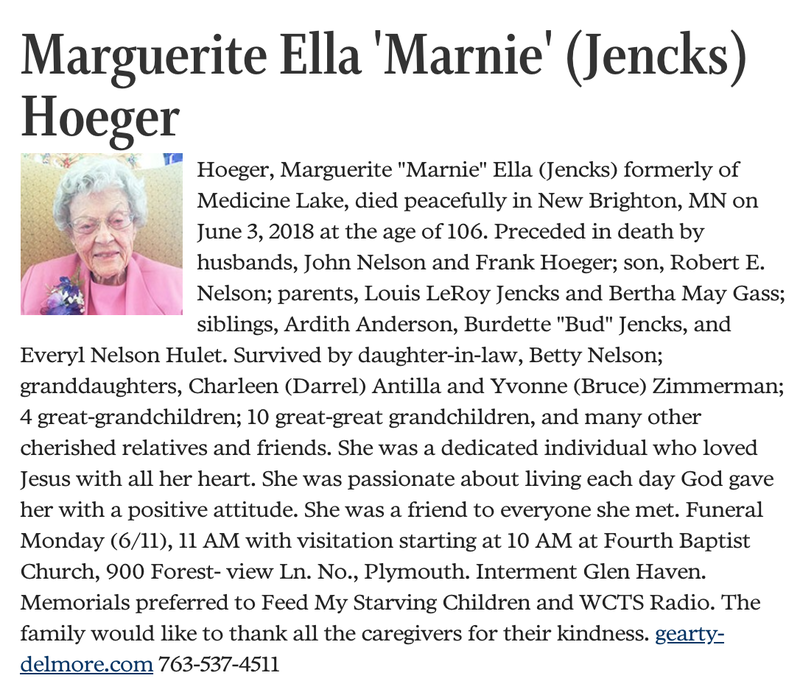 Survived by daughter-in-law, Betty Nelson; granddaughters, Charleen (Darrel) Antilla and Yvonne (Bruce) Zimmerman; 4 great-grandchildren; 10 great-great grandchildren, and many other cherished relatives and friends. She was a dedicated individual who loved Jesus with all her heart. She was passionate about living each day God gave her with a positive attitude. She was a friend to everyone she met. Comment: Lovely. Always hugged me at church. Now with Christ, our Hope!